CloudAhoy have had occasional interruptions in the GPS data acquisition under iOS 7. 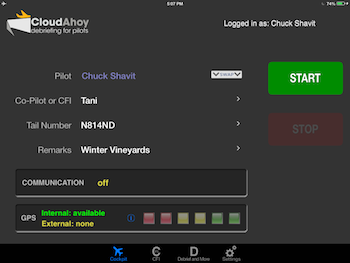 App version 3.1 fixes this issues and ensures that even if you are running a heavy-lifter app in the foreground (such as an EFB), CloudAhoy will not miss any GPS sample. As we wrote before, to log a flight CloudAhoy must be allowed to run in the background. App version 3.1 issues a warning if Background App Refresh is off, to remind you to turn it on. App version 3.1 now better conforms to Apple’s guidelines for iOS 7. Thanks for a great App, I’m based in the UK and thankfully I have a US Apple account as well as my UK account so I was able to download you App. I’ve got quite a few guys over here interested, do you have any plans to make it available in the UK?